Thanksgiving Foods That Harm Your Teeth - Adelberg Montalvan Pediatric Dental PC & Orthodontics too! It’s the most wonderful time of the year, and it’s kicking off with the most anticipated meal of the year — Thanksgiving! As you and your little ones mill about the kitchen this week in preparation for the festivities, it’s important to keep dental health top of mind. It may surprise you to hear that some of your favorite Thanksgiving staples can actually cause harm to your family’s pearly whites. 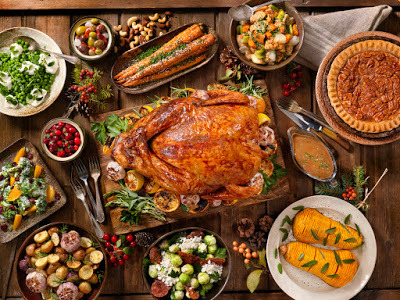 What Thanksgiving foods should we avoid? Cranberry Sauce: You guessed it… this Thanksgiving staple is loaded with sugar to combat the tart berries, so for sure, it can be harmful to your teeth. Not only that, but its acidity and vibrant red color can strain or damage your teeth as well. Candied Yams: This one is a catch twenty-two! While yams themselves are loaded with Vitamins A and C, which help keep gums healthy, candying them also adds excess sugar to the mix. Our recommendation? Prepare this sans-marshmallow! Mashed Potatoes & Gravy: What’s Thanksgiving without a side of mashed potatoes smothered in juicy gravy? We know this one is hard to swallow, but all that starchy goodness can attract cavity-causing bacteria, too. The gravy, being liquid, can coat your teeth with a layer of plaque-attracting sugar, as well — yuck! What can we do to keep Thanksgiving tooth-friendly? Drink plenty of water to wash away residual food particles. Eat sugary, sticky or stringy foods in moderation. Pair sticky foods with non-sticky foods to reduce the risk of sticking! Don’t forget to floss away leftover debris after eating.